I can turn into a vegetarian for this burger. That would definitely make my mum happy. But you guys, this Fully Loaded Veggie Burger is sooooo good that I even had it for breakfast today. I like to slather it with lots of Avocado Mint Chutney and ketchup because burgers can’t live without ketchup. Even if we pretend not to care about ketchup. Ketchup + Burger = Killer combination. 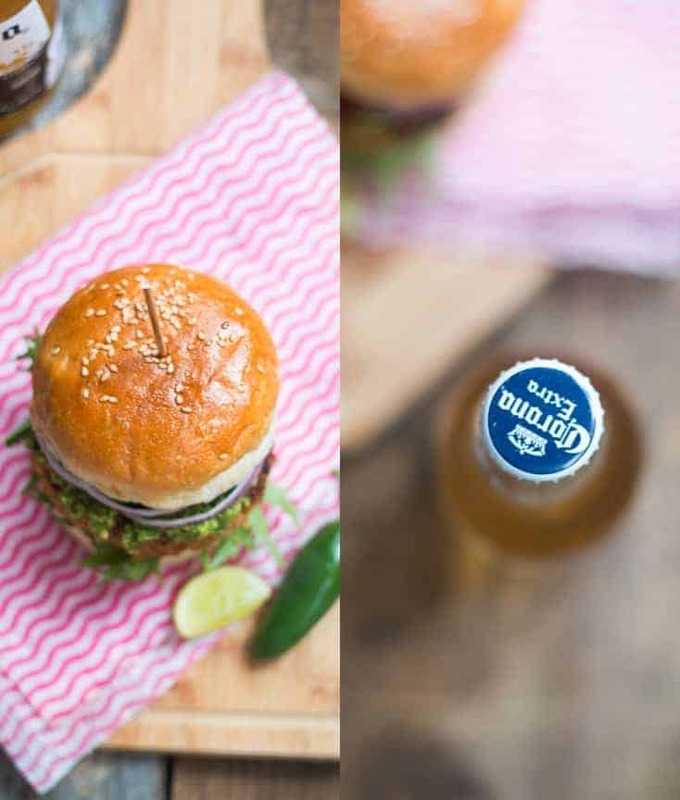 This burger is really worth trying at home and is one of those recipes you would want to turn to when you feel like having something fun! 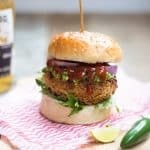 The best part – turn these patties into tiny veg balls and stuff them in your pitas, serve them as cutlets with chutney or just flatten them out for an awesome sandwich filling. I love it when I can recycle recipes, and this is totally my big favorite right now. It is so versatile and goes with anything without feeling out of place. 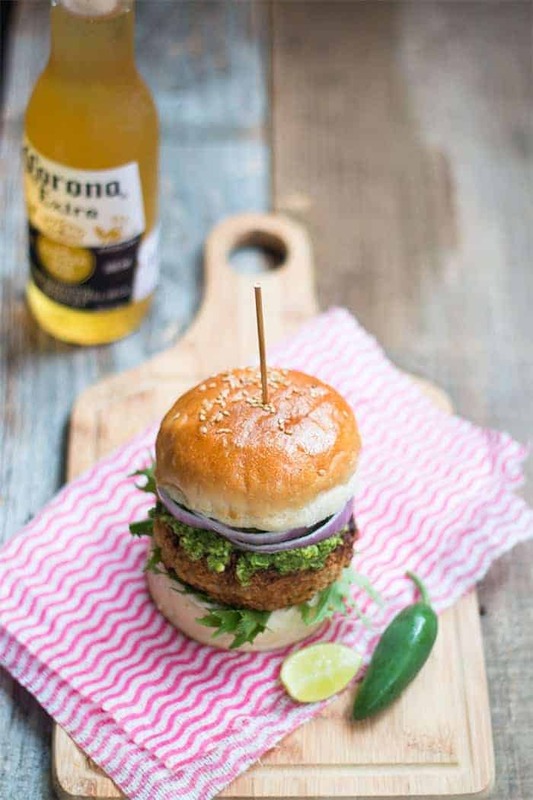 If you like this burger, also check out another awesomesauce Veggie Burger on my friend Sandhya’s blog. BTW are we friends on Instagram yet? Haww. Connect with me PRONTO and I’d love to swap stories. 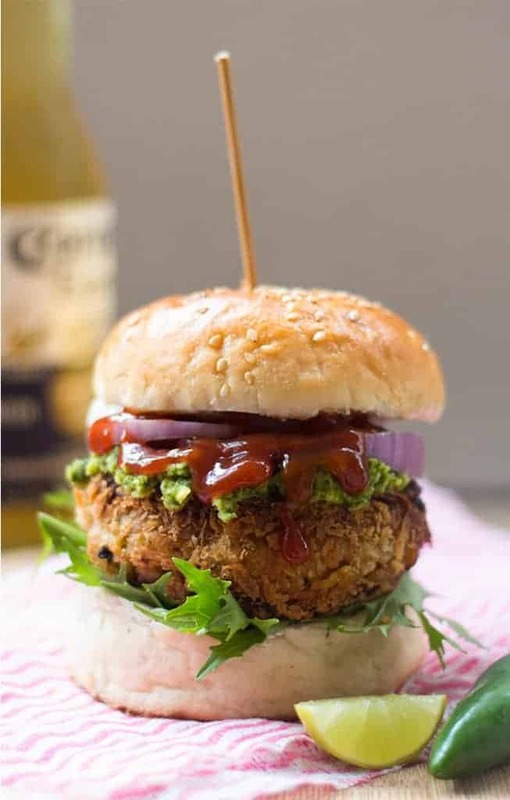 This fully loaded veggie burger with avocado mint chutney is crunchy outside and flavorful inside. A hamburger like patty makes sure you don’t miss the meat. To make the patty, add cooked chickpeas in a food processor and pulse a few times till coarsely ground. In a large bowl, mix together all the ingredients from chickpeas to salt listed under burger patty (leave aside flour, milk and breadcrumbs). Taste to adjust seasoning as required. In three different bowls, add flour, milk and breadcrumbs. Take ½ cup chickpea mixture, and form into a burger patty. Dust it with flour first , dip it lightly in milk and coat it quickly with bread crumbs. Slide the patties in oil, and cook for 10 minutes on each side till golden brown and cooked through. Grind all the ingredients under avocado mint chutney to make a smooth paste. Add a little water if required. I used a really spicy hot sauce. Feel free to increase if you are using any other hot sauce like Sriracha. Depending on the size of patty, the cooking time may vary by a few minutes. I love adding an egg or tomatoes to my burgers. Play around with this recipe to see what you like on your burger. Thanks Darshana! I hope you like it! Hello…just found this recipe and it looks amazing…one question…can it be baked rather than pan fried with the oil? How cool! Coriander chutney will work so well! Did you finally use the bulgur or skip it? Vaidehi, bulgur is a key ingredient, but you can substitute it with potatoes, sweet potatoes, quinoa or other grains too. So yes, you can give it a miss but increase another ingredient instead. You can even use Paneer. Can I give bulgur a miss? I can’t wait to try this for my vegetarian teenager. I think she will really like it. Thanks! It is a little like a falafel because of the chickpea base. I hope you try this out! Thanks Liz, they were awesome! I’m a veggie burger fanatic! Not a vegetarian, but I go weak in the knees for a good veggie burger and this one looks amazing! Love that it’s got a bit of heat, too. Pinning so I can definitely try this out soon! Hey! Thanks for stopping by 🙂 So 1 cup raw bulgur would give you approximately 2 1/2 cups cooked bulgur. It expands quite a bit. For this recipe, you just need to cook about 1/4 cup bulgur. To cook bulgur, boil 3/4 cup water and add 1/4 cup bulgur (daliya) to it. Let it rest for 10-15 minutes and it should be cooked. If it’s still slightly uncooked, just add a little more water and boil it on low flame for a few minutes. Hey – this really looks yummy….one basic question – how to cook bulgur to add to the recipe? Holy wow! 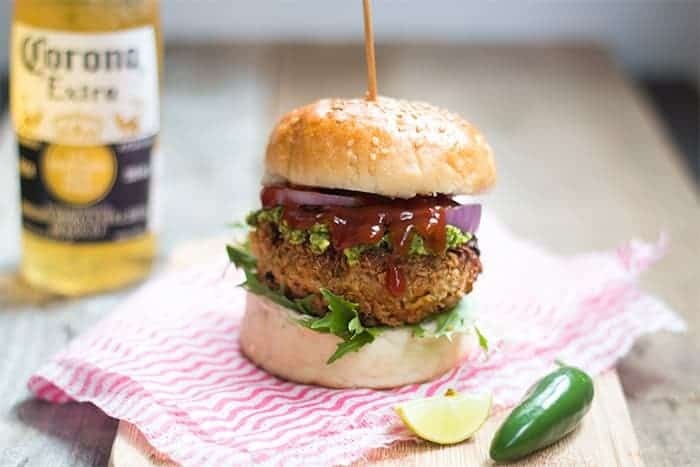 I love these burgers and that chutney – finger licking good! I’m seriously drooling over here! Can’t believe it’s a veggie burger! Looks scrumptious! This looks like one of the best veggie burgers EVER!! Can’t wait to try it! Looks so good!! And an avocado mint chutney?! I like that idea a lot. I have never been able to get veggie burgers right so this seems like it’s calling my name.